The Triennial Agreement between Canterbury councils provides for a Chief Executives Forum, reporting to the Mayoral Forum. Members comprise the chief executives of the 10 territorial authorities in Canterbury and the regional council (Environment Canterbury): Angela Oosthuizen (Kaikōura), Hamish Dobbie (Hurunui), Jim Palmer (Waimakariri), Dr Karleen Edwards (Christchurch), David Ward (Selwyn), Hamish Riach (Ashburton), Bede Carran (Timaru), Suzette van Aswegen (Mackenzie), Stuart Duncan (Waimate), Fergus Power (Waitaki) and Bill Bayfield (Environment Canterbury). The Forum is chaired by Jim Palmer, Chief Executive of the Waimakariri District Council. It meets at least quarterly, and is supported by the regional forums secretariat hosted by Environment Canterbury. maintains oversight of the Canterbury Policy, Corporate and Operations Forums and technical working groups. Front row, L to R: David Ward (CE, Selwyn District Council); Angela Oosthuizen (CE, Kaikōura District Council); Jim Palmer (CE, Waimakariri District Council – and Chair, Chief Executives Forum 2017-19); Dr Karleen Edwards (CE, Christchurch City Council); Michael Ross (CE, Waitaki District Council). Back row, L to R: Andrew Dalziel (CE, Ashburton District Council); Hamish Dobbie (CE, Hurunui District Council); Bede Carran (CE, Timaru District Council); Bill Bayfield (CE, Environment Canterbury). 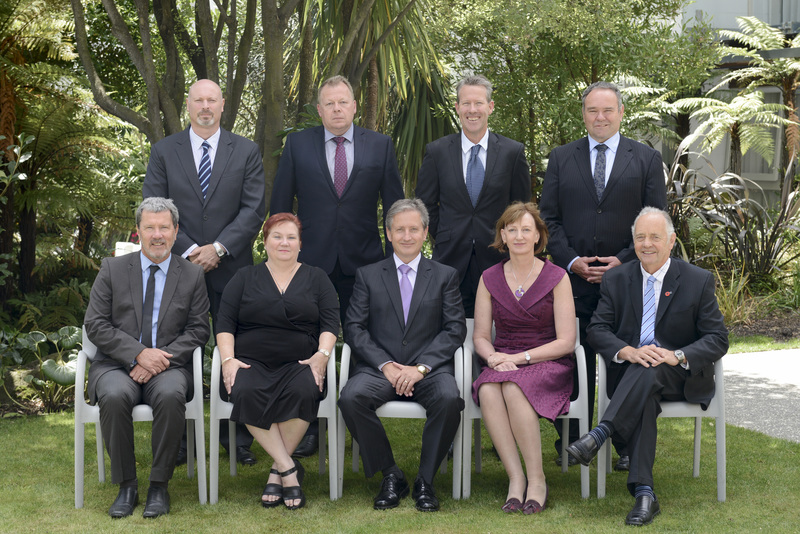 Missing in this photo: Wayne Barnett, CE, Mackenzie District Council; Stuart Duncan, CE, Waimate District Council. Hamish Riach became CE of the Ashburton District Council in September 2018.